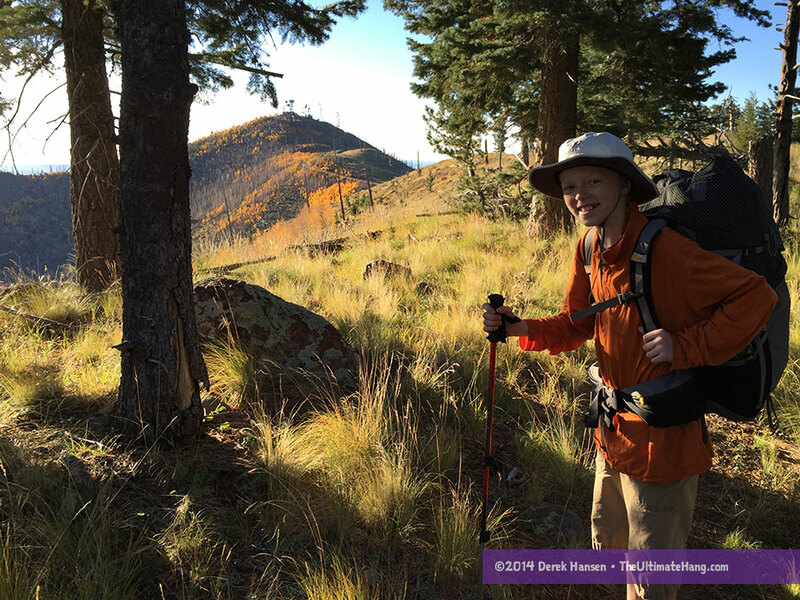 My son and I have been daydreaming about hiking the Sunset Trail on Mount Elden for years, yet each spring, summer, and fall has passed by with not much more than wishful thinking. Well, we finally put action behind those dreams and planned out a simple 12-mile (19 km) overnight backpacking trip to make it happen. 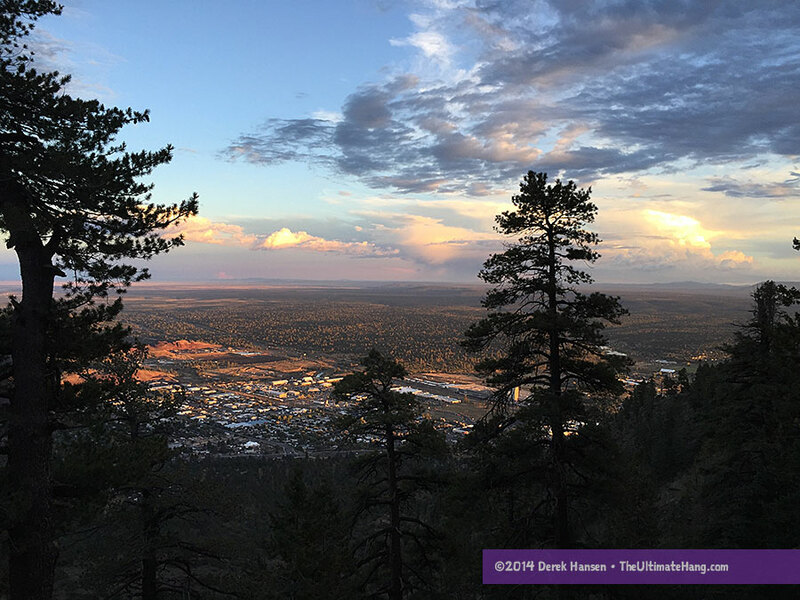 In order to finish the Sunset Trail, we needed to connect a few other trails, beginning with summiting Mount Elden by tackling the strenuous Lookout Trail: 2.5 miles (4 km) with 2,400 ft (731.5 m) of elevation gained. It took us two hours to reach the top, and not only had the sun given up its light, we had pretty much given up all our energy. Thankfully the trail leveled out and we were able to finish another few miles before complete darkness enveloped us and we made our camp. The days leading up to our planned getaway had overnight temperatures dipping below freezing at the base of the mountain, so we planned for frigid temperatures along the ridge line at 9,200 ft (2,800 m), while trying to pack as light as possible. My pack, which included 5 L of water and our hammock kit, weighed in at 24 lbs (11 kg). My son’s pack, which included all our food and 2 L of water, weighed 17 lbs (8 kg), a hefty load for a ~90 lbs (41 kg) kid. Thankfully, the temperatures that night were warm. An inversion brought us very comfortable conditions as we snuggled into our hammocks. 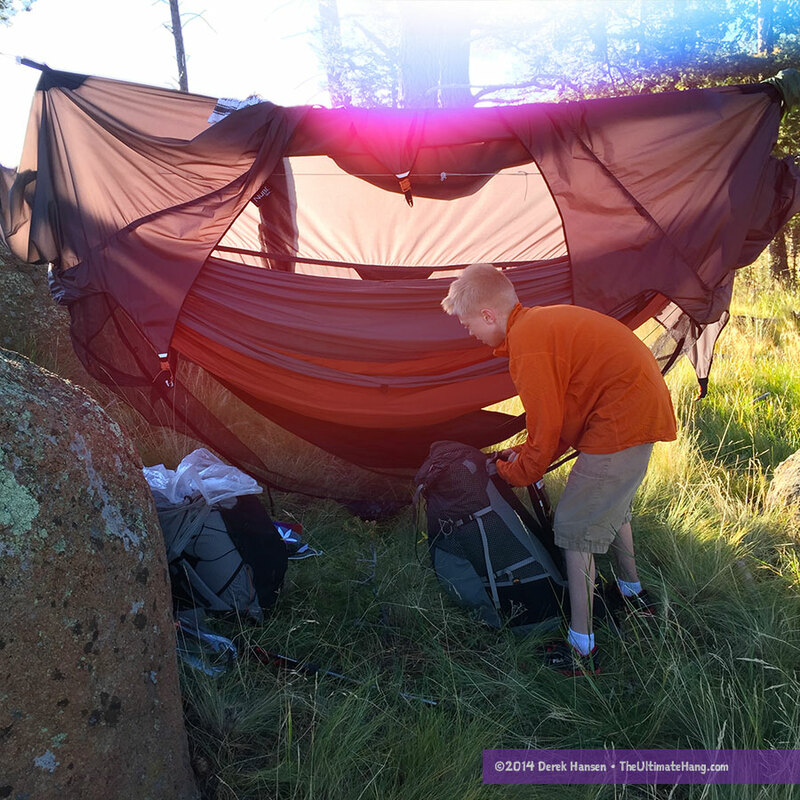 For this trip we were testing the Nubé tarp with matching hammocks from the same company. We set up the hammocks in a bunk bed configuration, my son taking the top spread. We were more than toasty, and throughout the night we shed layers. The warmer-than-expected temperatures, enclosed tarp space, close proximity to each other, and warm quilts all contributed to a nice, comfortable sleep. My son has been complaining of getting cold feet in the night, so for this trip I also ordered a pair of down sleeves from Jacks ‘R’ Better. These versatile down-filled sleeves work great as leg warmers and down booties while sleeping and worked great (too great, actually) at keeping his feet and legs warm. I think this was the first time his feet were actually toasty. The location we picked was just about perfect. We had boulders shielding us from the wind on one side, and were protected by thick trees on the other. The grassy area provided a durable surface, yet we hardly left a trace with our minimalist hammock setup. 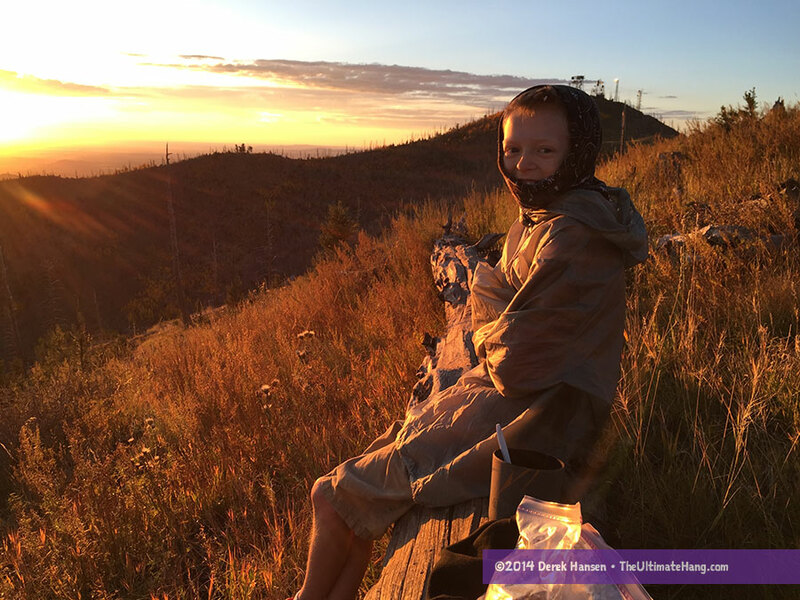 We both awoke early, around 5:30 AM, and had front row seats to the sunrise. The Earth was peaceful, without so much as a bird chirping in the morning. It was glorious. The warm glow from the Sun’s rays gave everything around us a touch of light sienna. 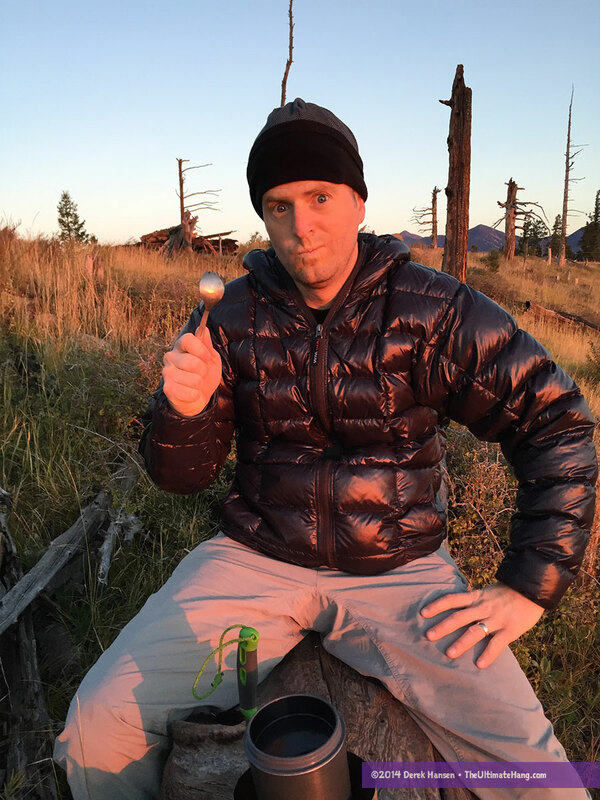 We enjoyed a favorite breakfast—warm granola with powdered milk—and packed for an early start to our hike. 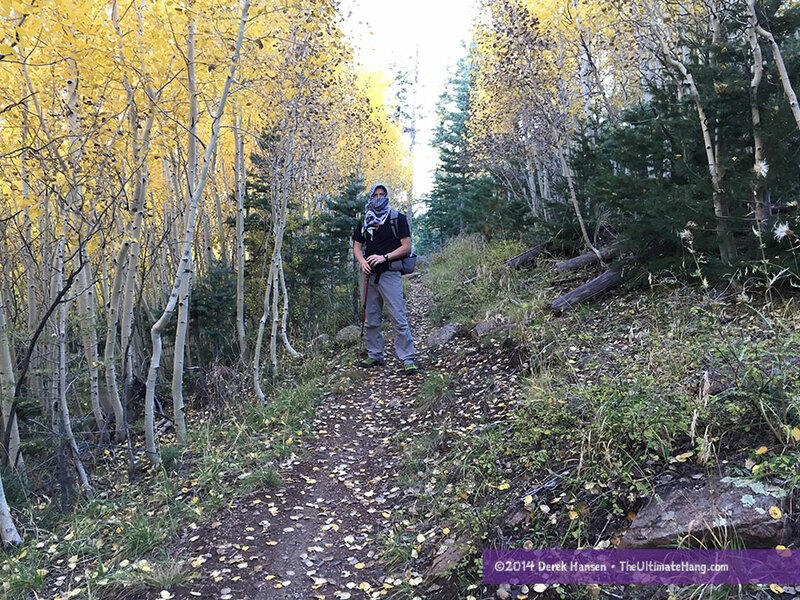 We had roughly 8 miles (13 km) to finish that day to meet our rendezvous point at Little Elden Springs. The hike was absolutely glorious. 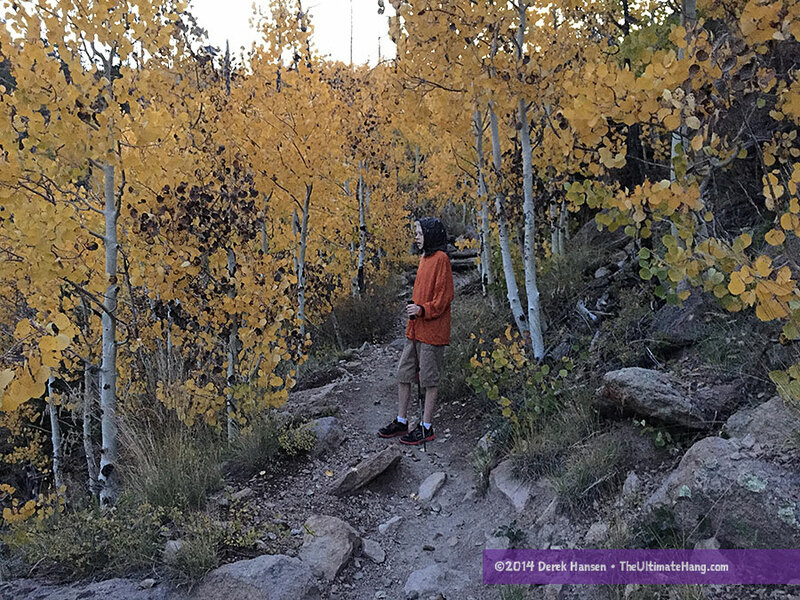 The aspen trees were in full fall color and we often walked on a trail paved with golden leaves. The rest of the trail was a gentle downhill hike, in stark contrast to the day before. We took periodic stops along the trail until we reached our end point at the springs around 11:30 AM. 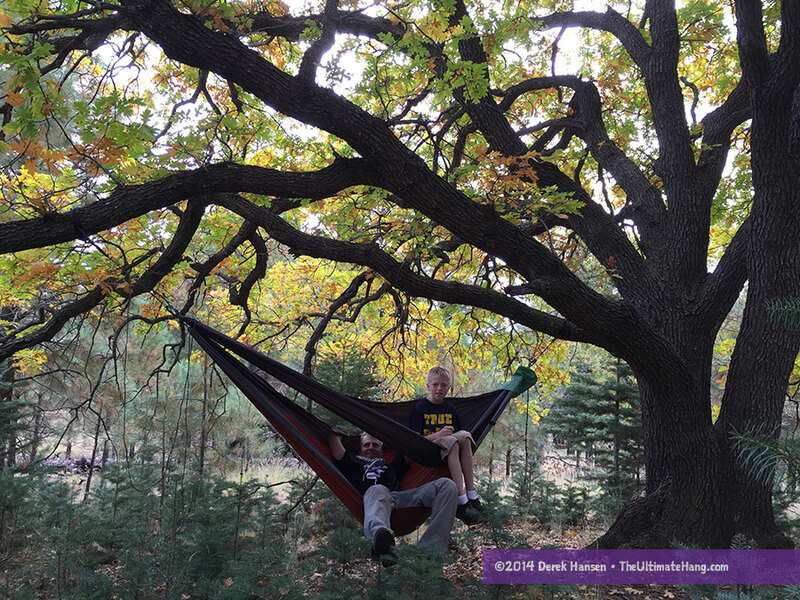 Do you have a hammock trip you’d like to share? Want to share what worked? Drop me a line. You make me laugh 🙂 I have lots of those epic indoor adventures myself 🙂 Although, I don’t have the vertical climb you do (I don’t have any stairs). Looks like you had the weather with you. Great trip report. Glad you finally made the dream happen. Thanks for sharing the trip report and gorgeous pictures. 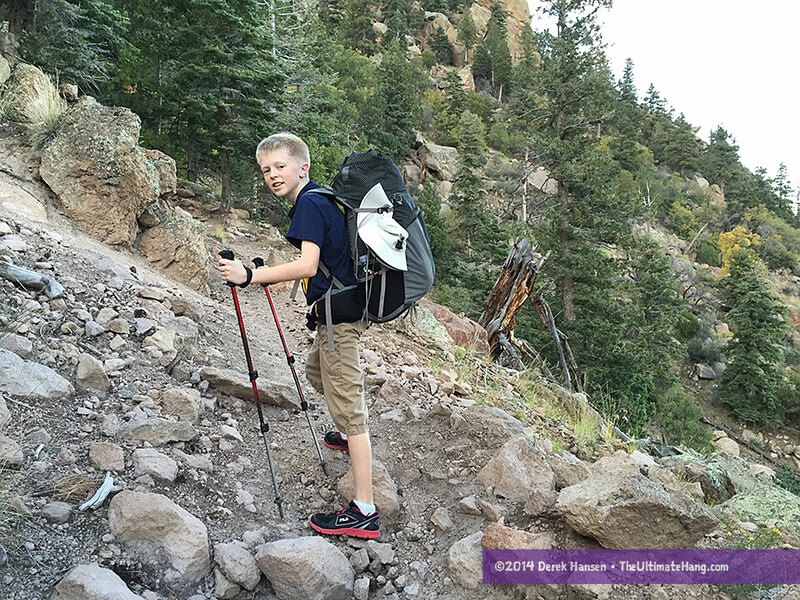 It’s wonderful you can share your hikes with your son. 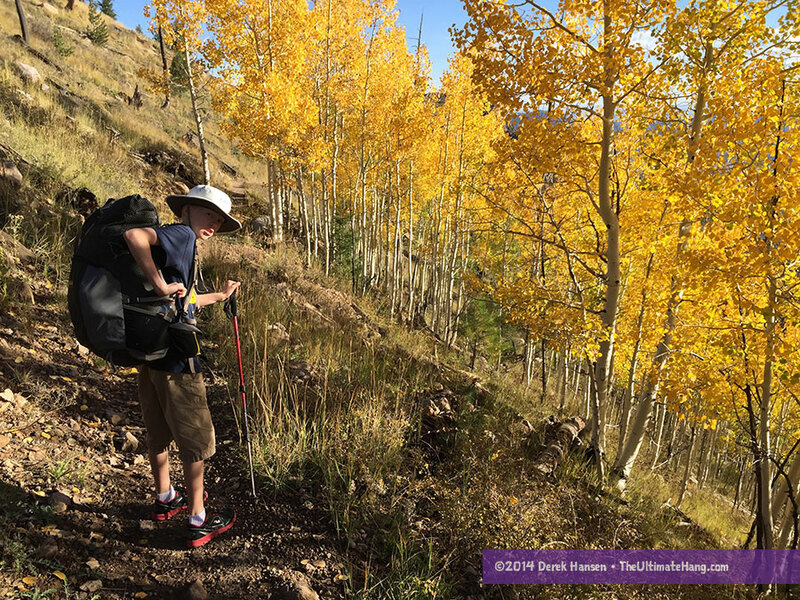 Hiking with my son brought us closer than regular life ever could. Thanks for the report and your reviews. Review coming for the Nube setup? Or did I miss that? Next week. 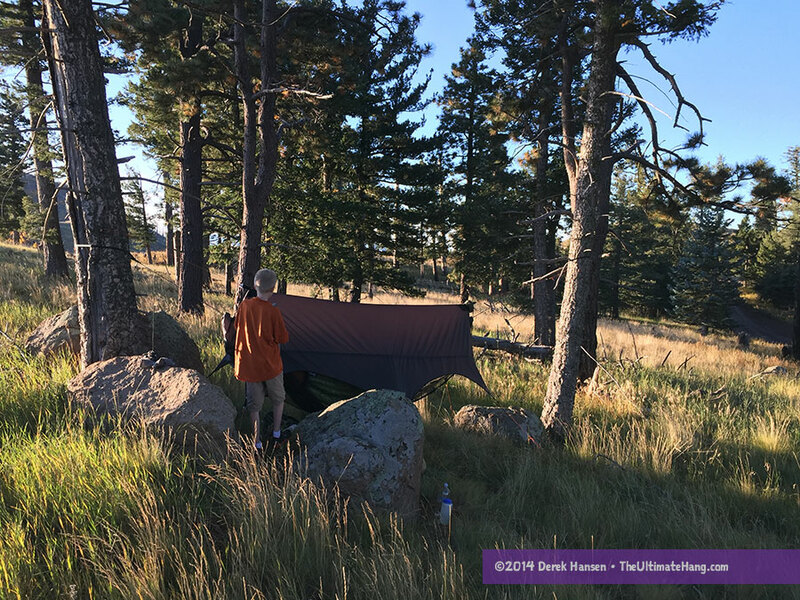 We did use the Nubé tarp and Sierra Madre hammocks on this trip, but I still need to get the rest of the details and photos for the review. I’d love to see more info on setting up in a “bunk bed configuration”. Great report och beautiful pictures! Regarding bunk bed rigging I´ve found that my kids don´t “get” laying diagonally in the hammock. I usually rig their hammocks tighter, with a shallow angle to the trees. This has the added benefit of reducing the overall height of the bunk bed, which in turn means that the tarp gives better coverage for the lower bed. Since the kids don´t weigh all that much the added tensile forces are not that high. Do you happen to have a full gear list with weights for this trip? Every time I go camping in similar weather I seem to end up at ~24lbs even before food and water.